goals. Within organizations, conflict is inevitable. It can be a healthy reflection of diversity, if the people within the organization see themselves as belonging to an interconnected whole. Destructive conflict is often symptomatic of underlying systemic issues that have not been addressed. lose their way when they get mired in a never-ending cycle of ignoring conflicts, or attacking and counter-attacking. work from their strengths. By maximizing their combined power, people can then develop a way forward in a holistic and sustainable manner. 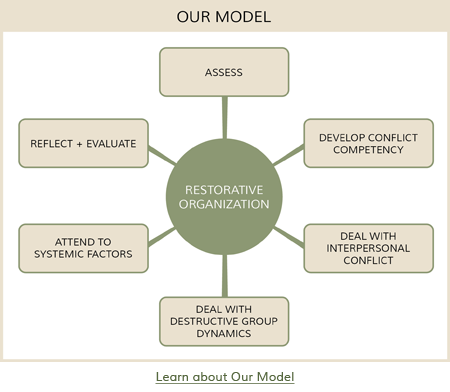 the way we structure our interventions – respect and inclusion are at the forefront. motivation and commitment to shared organizational values are more productive and longer lasting. We recognize the interdependence of all those within an organization and work at the interpersonal, group and systemic levels.